Bought another SSD for the Bobulator. 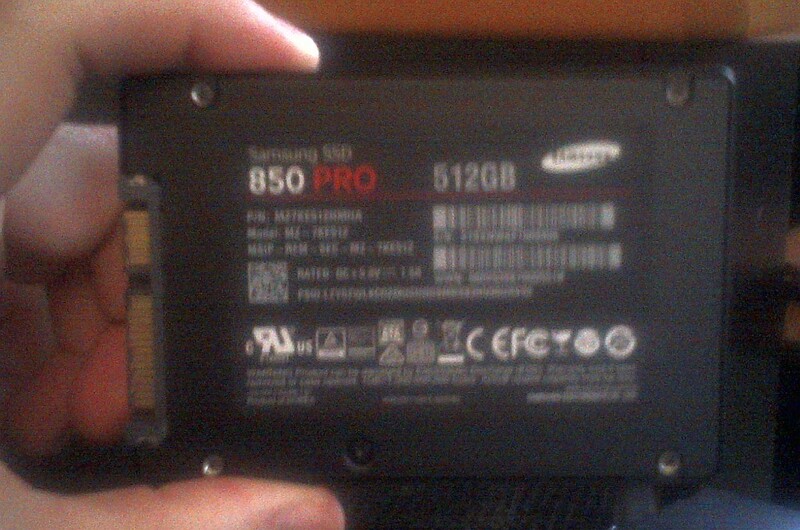 This is a 512GB Samsung 850 Pro and it replaces the original 256GB Samsung 840 Pro from the first post as my OS drive. I'm still running a 512GB 840 Pro for my applications and a 1TB 840 Evo for my Steam games. I really didn't neeeeed a new drive for my OS, but I really wanted an excuse to buy an 850 Pro. It is the very first consumer device to use three-dimensional integrate circuits. Up to this point, every circuit board has been two-dimensional, with all of the ICs sitting side-by-side on a flat plane. With three-dimensional ICs, two or more of these flat planes are sandwiched on top of each other. For NAND memory, this is known generically as 3D NAND, which Samsung is calling V-NAND (V for vertical). This is a huge technological innovation. In the past, the number of ICs on a chip was limited by the size of the wafer and if you wanted more ICs, you needed to shrink the die size. We're below 20nm now and pushing for 15nm and smaller, but this is getting harder and harder. We won't be able to shrink much smaller than 5-6nm as we're starting to hit atomic boundaries. With three-dimensional integrated circuits, we can now stack several layers of circuits on top of each other, thus getting more circuits on a chip that occupies the same square area. Furthermore, manufacturers can actually step back to larger die sizes which are cheaper to build. The 850 Pro has a 40nm die size, which is roughly double the 22nm die size of the 840 Pro. Anyway, here are a couple of pictures. There isn't much to see, as the package looks pretty much identical to the 840 Pro. I apologize for the potato quality of the pics, I took these with my crappy Blackberry. The 840 Pro was already a screamer, but the 850 Pro is even faster. I was able to pull about 90,000 IOPS (4KB random read/write) with the 840 Pro, and I'm seeing about 102,000 IOPS with the 850 Pro. Although that's only about 13% faster, 12,000 additional IOPS is nothing to sneeze at. By comparison, a spinning disk can only push about 100 IOPS total. Remember when we use to complain about the Window boot up time? Now I think...it's not even worth getting a snack because the computer will be up. 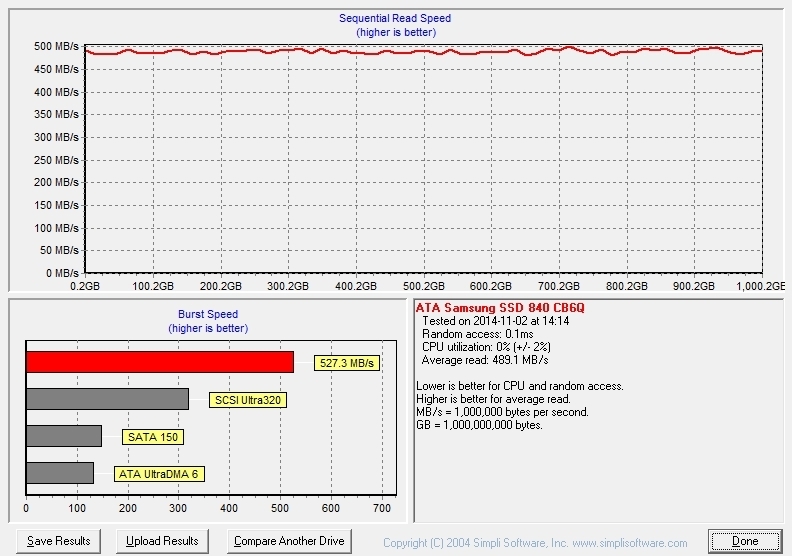 It's amazing 3D configuration adds that much power to SSDs. I remember I never liked turning my old gaming PC's off because of the damn boot up times! And when we had to walk to school in our bare feet uphill, both ways! If any of you guys own a Samsung 840 EVO SSD, Samsung has recently released a performance repair application that drastically improves IO on older files. There is a bug in the old 840 EVO firmware that causes unnecessarily aggressive rewrites on older files as voltage drops on the associated memory cells. Over time, this causes IO for these files to slow down substantially. I have a 1TB Samsung 840 EVO SSD that is used solely to store games. As you can see from this HDTach report, performance was absolutely abysmal. My "screaming fast" SSD was pushing about 23MB/s and rarely spiking up to a whopping 100MB/s, when I should be seeing a sustained throughput of 450MB/s or more. Samsung released a firmware fix for the 840 EVO bug a couple weeks back that would prevent the stale file issue from occurring in the future. They also released an application that reads and rewrites every sector to fix the issue with existing files. It took a couple hours to process the ~525GB I have on the drive and required a reboot to get started. The application was very straightforward, just install it and click "next" a couple times. Once the application was done, the performance difference was night-and-day. I ran HDTach again with identical settings and saw a very smooth sustained throughput of ~490MB/s. I played a couple of disk-intensive games (Skyrim with a ton of texture mods and Watch Dogs) and they loaded and played much more smoothly. So if you've got an EVO, get the firmware update done and run the performance restoration tool! It looks like the issues with the Samsung 840 EVO weren't entirely fixed by Samsung back in November. I've been seeing really flaky performance off the disk again. I ran another HDTach benchmark and performance is even worse than it was before I ran the performance restoration tool. 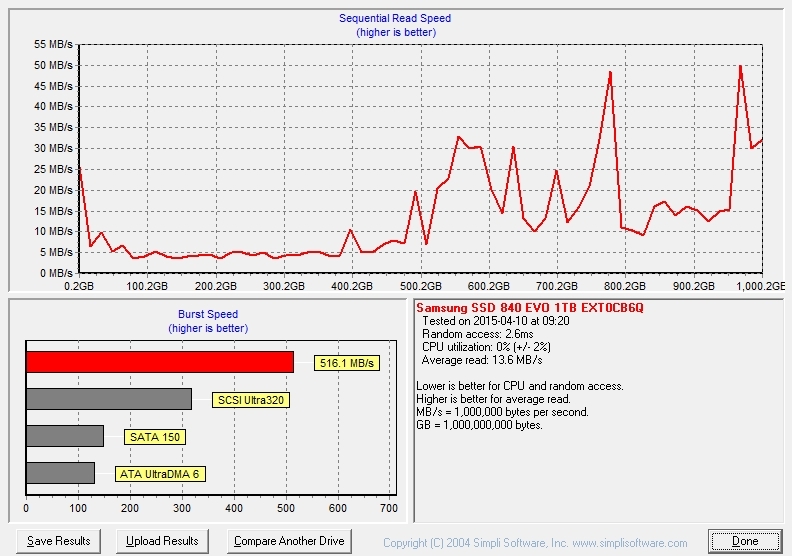 Average read speed went from 23MBps before the tool to 489MBps afterward, and is now down to an abysmal 12.6MBps. Latency was at 1.2ms before the restoration, 0.1ms afterward, and has now skyrocketed to 2.6ms. 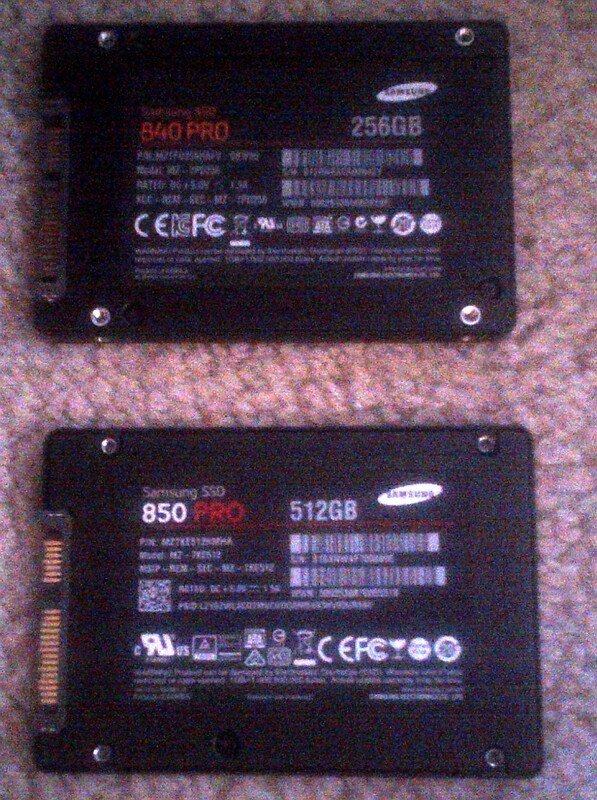 I'm tired of screwing with this drive, so I've ordered a Samsung 850 Pro 1TB drive to replace it. What are the programs you use to do testing and performance restoration? I just have my main OS HD as an SSD and would like to see what it's doing. I use several tools for benchmarking, but the simple one with the nifty graphs shown above is HDTach. It's definitely worth a download. 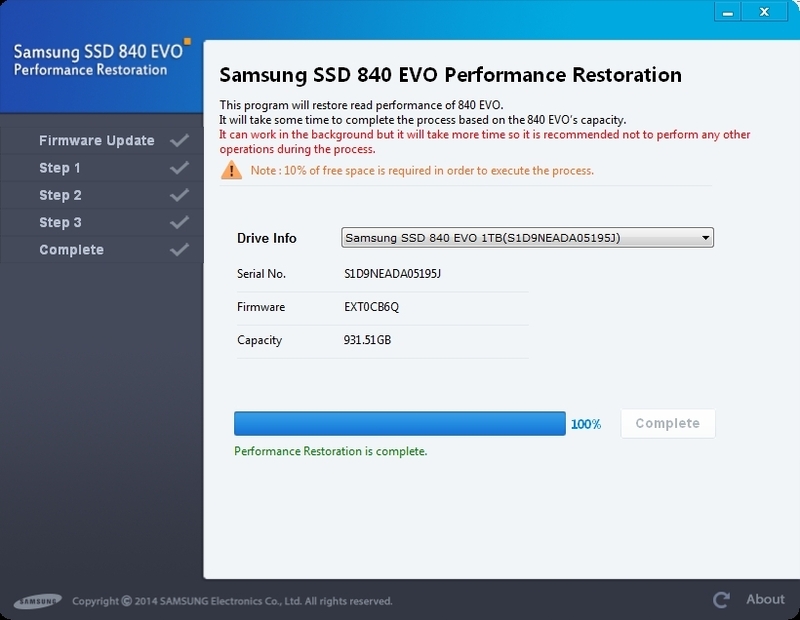 The performance restoration application is a proprietary Samsung application created specifically to address the issue with the 840 EVO SSDs. Once the firmware has been updated to a version that purportedly fixes the underlying bug that caused the slowdown, the performance restoration tool reads every single file on the SSD and rewrites it back to the drive to fix the issue. Unfortunately, the performance restoration tool will only run one time and won't let you run it again, and the firmware fix obviously didn't correct the degradation of performance over time. The new drive is in and it's a screamer. 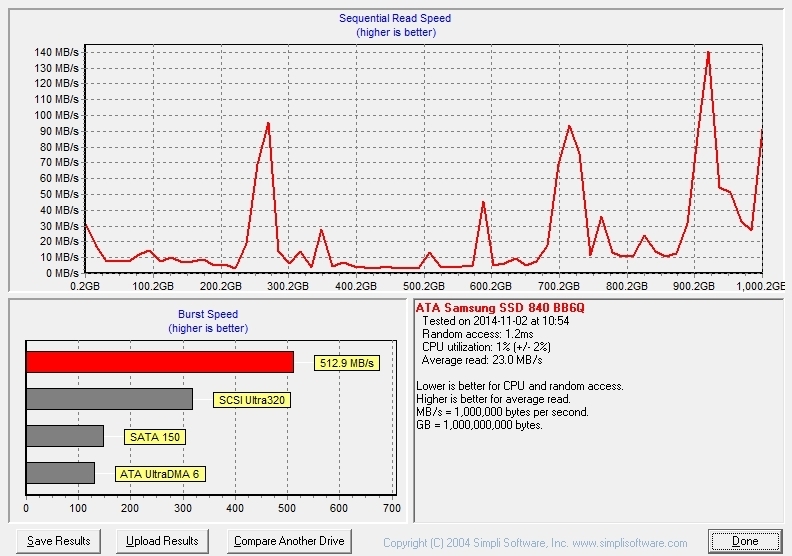 Latency of 0.1ms and a burst speed of 517.9MBps with an average read of 485.3MBps after migrating everything over. I'm saturating the SATA bus at this point, so I'm impatiently waiting for the NVMe bus standard to go mainstream. The Intel 750 NVMe SSDs are launching in a couple weeks, and hopefully Asus will launch a new board with NVMe support shortly thereafter. NVMe with a PCIe 3.0 x4 connection has a whopping 32Gbps of bandwidth, which absolutely trashes SATA 3 at 6Gbps.